The 4th anniversary of International Yoga Day was celebrated on a large scale throughout the country and across the globe today. 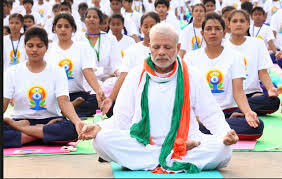 The main function in India was held at Uttarakhand's capital Dehradun, where Prime Minister Narendra Modi led thousands of people in performing yoga asanas at Forest Research Institute this morning. Addressing the gathering, Mr. Modi appealed to the people to make Yoga a part of their lives. He said, Yoga has emerged as the biggest unifying force in the world. The Prime Minister said, Yoga has been a part of Indian tradition and it integrates the people. Mr Modi said yoga has shown the world the path to wellness from illness. Vice President M Venkaiah Naidu along with several Union Ministers and Chief Ministers of their respective states also joined the celebrations in different parts of the country. Participating in the event in Mumbai, the Vice President stressed on the need to include Yoga in school curriculum to create a healthy nation. Maharashtra Chief Minister Devendra Fadnavis, also participated in the programme. In the national capital, several dignitaries including Women and Child Development Minister Maneka Gandhi, Information and Broadcasting Minister Col Rajyavardhan Rathore and Delhi Lieutenant Governor Anil Baijal took part in mass Yoga demonstrations at various places. Speaking at the celebrations held in Shahdara, Mr Rathore urged people to unite with Yoga to build a healthier new India and a happier world. Ms Maneka Gandhi participated in the yoga event with pregnant women. In Jammu and Kashmir, the main function was held at the Sher-i-Kashmir Indoor Sports Complex in Srinagar. In Leh, Indo Tibetan Border Police celebrated the day on the banks of Indus River. In Uttar Pradesh, the main function was held at Raj Bhawan in Lucknow. Union Home Minister Rajnath Singh participated in the event. State Governor Ram Naik and Chief Minister Yogi Adityanath were also present on the occasion. In Rajasthan, around one lakh 60 thousand people performed yoga simultaneously at one place in Kota, setting a new record. In Gujarat, 75 lakh people took part in mass yoga demonstrations organized across the state. In Nagaland, Governor P. B Acharya led hundreds of people in performing yoga asanas, at the programme held at Indira Gandhi Stadium in Kohima this morning. In Tamil Nadu, Union Minister for Commerce and Industry and Civil aviation Suresh Prabhu led the celebrations at a college near Chennai. A seminar on the importance of Yoga was also organized in News Service Division of All India Radio. Yoga demonstrations were also held at various foreign missions around the world. Abroad, India's Permanent Mission to the UN organized celebrations at the North Lawn in the UN Headquarters in New York. In Sri Lanka, thousands of people attended the programmed organized by Indian High commission in Colombo and consulates located at Jaffna, Hambantota and Kandy organized programmes on the occasion. In Nepal, monks and local citizens performed Yoga exercises at 12,500 feet in Muktinath. In China, Indian envoy Gautam Bambawale along with 500 yoga enthusiasts participated in a colourful event in Beijing. Reports of celebrations also poured in from South Korea, Croatia and Finland.